“I first started talking to our school’s Pastoral Care Worker in year 9 about some help for a photography project I was doing. She showed me the way around my camera and I have learnt a lot, and my photography dreams have become a reality. Being involved with Tamika has also helped my school work out a lot. I have learnt coping mechanisms, my anxiety levels have come down immensely and I can cope with situations now that I wouldn’t have been able to cope with two years ago.” Tahlia, Year 11 student. Your donation to SMG makes it possible for young people like Tahlia to learn, grow and reach their full potential. In May, the Federal Government announced that the National School Chaplaincy Programme (NSCP) would be extended beyond 2018. This is great news for the 340+ schools that access an SMG Chaplaincy Service. After this announcement, SMG Chairperson Graham Brown and I met with our new State Education Minister Hon John Gardner MP to advocate for the continued support of School Chaplaincy and to commence discussions about co-investment from the State Government. The renewed NSCP will have a greater focus on supporting students and school communities affected by bullying and in particular cyber-bullying. Data we collect at SMG about our services has already confirmed that bullying and harassment is the second highest issue for students accessing our Chaplains. We are already providing support, guidance and leadership in this space, and welcome this greater area of focus to support children and young people across South Australia. Tackling bullying in schools, and in society is not a one person job, nor is there a quick fix or easy solution. We need to be building each other up, not tearing down. We need to include, not exclude. We need to care, not ignore. We need to love. The SMG team aims to be a part of the solution bringing about the best possible outcomes for SA’s children and young people. I hope you will continue to stand with us because together we are stronger and will make a bigger difference and positive impact in our community. 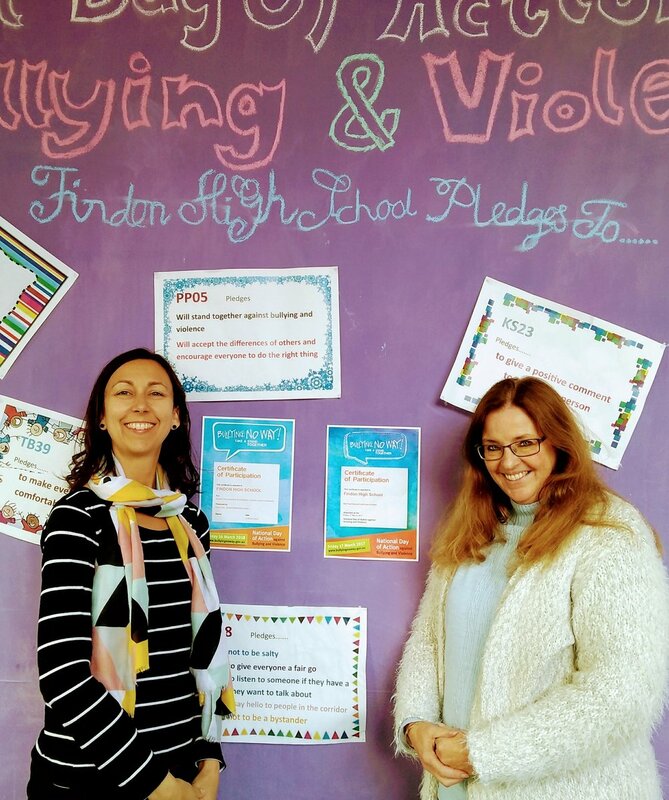 The Student Action Team, Kathy Pivetta, SMG Pastoral Care Worker and Kiah Craig, Student Wellbeing Leader are working together to improve the anti-bullying program at Findon High School. Last year students made pledges against bullying which promoted friendship as well as respectful and supportive behaviours. These pledges were revisited recently, with feedback obtained from the whole student body to see how students were going keeping their pledges, and what progress had been made to reduce bullying. “The Student Action Team’s leadership identified that there was improvement, but more work needs to be done. They provided suggestions for updating our Safe School Policy. This initiative has also created space for personal reflection on our actions and their impact on others. The team are a strong voice in leading the school towards future anti-bullying programs” Kathy shared.